The best known of these film gatherings are Sundance and Cannes dealmakers' events at which distributors grapple to land the year's most promising movies. South by Southwest, by contrast, has long been considered more of a collaborative environment or conference than a buyers' festival. "The South by Southwest acquisition is not really the same as Sundance  there's not really the danger that someone else is going to buy it right then, so people take their time," says Amanda Lebow, a sales agent who was working on behalf of the indie drama The Dish & The Spoon, starring Greta Gerwig. "This isn't like Sundance during the '90s where people are made multimillionaires by the Weinstein brothers overnight," says Kill List director Wheatley. "It takes the pressure off because we aren't expecting that." Festival organizers, meanwhile, have tried to keep things low-key. "We don't have an industry office like the Toronto International Film Festival or Cannes," says film festival producer and senior programmer Janet Pierson. "Everyone has to wait in the same line to see a movie." That spirit may be why the mainstream industry is increasingly taking notice: a calmer, more inclusive festival attracts still developing talents, which means a savvy distributor or agent can get in on the ground floor with the next big thing. Monsters, for example, was submitted to SXSW before its special effects had even been completed: the film actually cut between live-action scenes and blank screens with text descriptions like "alien arm retracts here." For that reason, it was rejected by every other festival to which writer-director Gareth Edwards applied  including Sundance and the Berlin Film Festival. Edwards cut his teeth directing TV shows in the U.K., having bribed producers by offering his special-effects expertise at discount. 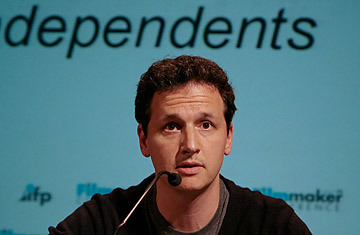 Following Magnolia's purchase of his film, he was flown immediately to Los Angeles, where he had 60 meetings in three weeks. "Genuinely, I will forever divide my life between before South by Southwest and after South by Southwest," he said from his house in London, where he is writing the script for the coming Godzilla 3D reboot, produced by Legendary Pictures. Indeed, sometimes what acquisitions executives are looking for is not so much a marketable film as an opportunity to get into business with a major talent. Being able to forge relationships with auteurs early on is truly the prize of picking up a young artist. At the screening of Kill List, Quinn looked admiringly at Wheatley. "We certainly want to keep the connection with Ben," he said when asked if he planned to bid on the film. (Magnolia owns rights to Wheatley's well-received first feature, Down Terrace.) Indeed, Quinn made an offer the very next morning, after staying up until 5 a.m. drinking whiskey with the film's producers and League in the Alamo's upstairs office to celebrate its opening. In the end, however, it was Quinn's competitor Bocco who secured North American rights to Kill List for IFC's imprint, IFC Midnight. (Before leaving Austin, she'd also secured North American and foreign rights to Weekend, a gay-relationship drama by writer-director Andrew Haigh.) A few other big names made buys as well: Weinstein Bros. announced its acquisition of the feel-good football documentary Undefeated on March 14  just two days after its premiere at the festival. Kino Lorber acquired U.S. rights to El Bulli: Cooking in Progress, about Spanish chef Ferran Adriá. And Anchor Bay eventually secured the North American rights to the thriller The Divide, which also attracted interest from Sony, Relativity, Xlrator, E1 and FilmDistrict. As for Quinn, he partnered with AT&T and several others in an innovative deal for the documentary Conan O'Brien Can't Stop. "It's disappointing to make an offer on a movie and not get it," he said of Kill List from his cell phone as he boarded a plane out of Austin. "But I'm excited about what we did pick up, and I'm happy for their team." There's always next year  although with it may come an even bigger crowd of competitors.